Do you have a company that builds things? Do you distribute products? Are you as happy as you could be with how smoothly your financials, inventory, shipping, sales and management tools all work together? If you’re like most growing companies, we bet you could be happier! You need SAP Business One. SAP is a complete, end-to-end software for running your small or mid-sized business. ACUMEN Corporation’s subject matter experts can help save money in your warehouse, move products in and out on time (making sales folks happy! ), and consolidate all your different software into one easy to use platform. In fact, our team helped optimize inventory for a food products company – and saved them over $300,000 in stocking levels! And we’ll show you a demonstration of the affordable, #1 world-class business software, SAP Business One! Our primary focus is helping businesses solve the complex challenges facing inventory management today. For over 25 years, ACUMEN consultants have helped distributors and manufacturers to achieve and maintain successful service levels and fulfillment with financially sound practices. Inventory optimization, ERP solutions, CRM software, multi-platform systems integration and implementation, along with Financial best in class solutions are where we shine. With these as our areas of expertise, we are often know as SME’s (Subject Matter Experts) by our client base. We can do that with consulting services, and/or we can provide the software you need to accomplish those endeavors. We have earned a reputation for excellence in the selection of software and have vetted SAP Business One for the complex processes and structure within your company – from short-term solutions to long-term goals. 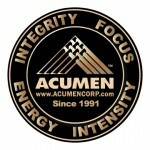 ACUMEN Corporation provides complete and sustainable solutions for small to mid-sized wholesale distributors, manufacturers, service industries, and any size inventory intensive operation. To find out more about how we can help your company, please take a look at some of the projects we have recently completed for our clients on the Testimonials page.